This dry air supply project development news page provides information on the development programme (data, pictures, comments and calculations) and product performance data. First of many fabricated heat exchanger coils. 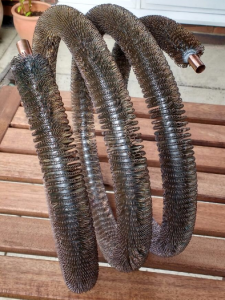 Pipe purchased with external wire heat dissipation fins which were soldered directly to the external pipe wall. As part of the Dry Air Supply Project development programme the effect of internal heat exchanger turbulators on the thermal performance of the exchanger were investigated. These were fabricated in-house using a proprietary technique using corrosion-resistant, stainless steel wire. 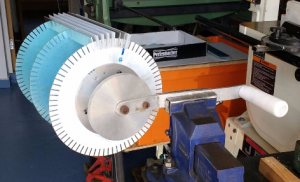 The fabrication technique allows a variety of turbulator designs to be easily made.